What if there were no bad suggestions? 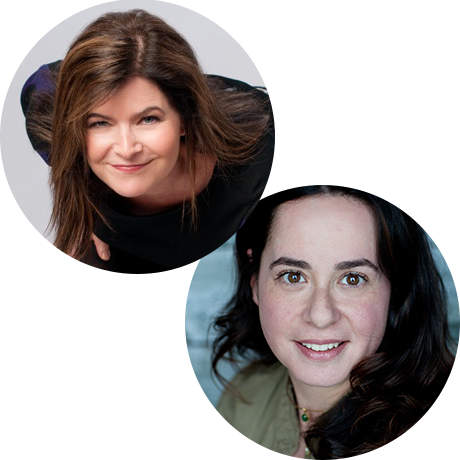 Susan and Rachael give us some insight (with a generous amount of hilarity) on how the foundations of improv and the classic ‘yes, and…’ can be applied to almost any situation in life. One of the fundamental ideas they teach their improv students is that when we listen to others’ ideas and add to them, rather than replacing with our own, we’re able to build something greater together than we could have alone. Turns out this concept also helps us to be better, kinder human beings in general. Who knew?CreativeMornings/Chicago is hosted & organized by Jen Marquez and coordinated by Marlene Paez. Video by Alejandro Moore, Chris Mendoza, and Amy Ginn.Follow along with us at @Chicago_CM! Susan Messing A NJ native and graduate of Northwestern University’s Theatre School, Susan has been an improviser and comedian for almost thirty years. She is an alumna of the iO Theatre, Second City’s Mainstage, and a founding member of Chicago’s infamous Annoyance Theatre. Not only is she a performer, but she’s also an instructor of comedy, having created and taught her curriculum at iO and iO West, The Annoyance Theatre and The Second City, among other places around the globe. She is also an adjunct instructor for DePaul University, The University of Chicago, and The School at Steppenwolf. Her standup act with her puppet, Jolly, has been featured at the HBO/US Comedy Arts Festival in Aspen, Comedy Central’s Premium Blend and NBC’s Late Fridays. Yet, her most impressive bit movie role was as a bad stripper in a halo brace in Let’s Go to Prison! You can catch her performing every Tuesday night at the iO with Norm Holly in MOLLY, Thursday nights in her own critically acclaimed show, Messing with a Friend, now in its 11th year at The Annoyance, and Friday nights with The Boys at The Second City. She was in the lineup for the TBS/Just For Laughs festival all five years of its residence in Chicago and she presented ‘Braving the Unknown’ at TEDxUChicago in 2014. Susan has been recognized as “Improviser of the Year” by Chicago Improv Festival, “Best Improviser” by the Chicago Reader and “Funniest Woman in Chicago” by Chicago Magazine. Rachael Mason Rachael began her career in improvisation at Skidmore College, home of the National College Comedy Festival, with the Ad-Liberal Artists. After graduating with a degree in English Literature, concentrating on Shakespearean Studies, she moved to Chicago to study improv comedy with Del Close. She is now the head of Advanced Improvisation for The Second City where she created the Scenic Improv and Dramatic Improv programs as well as The History of Satire Series for The Second City Training Center. Rachael has performed musical improv with Baby Wants Candy at The Edinburgh Fringe Festival, directed and performed at The Annoyance, played with The Hot Karl at ComedySportz, and had almost every job at iO (where she was Training Center Director for 8 years), done The Spoletto Festival with The Second City National Touring Company, and is currently in the cast of The Second City Improv All-Stars at The Up Comedy Club as well as with Second City’s first resident improv show, The Boys, with Susan. She is a mom, jerk, and nerd.